Odyssey Tattoo opened in Bentonville in December 2005. We undergo rigorous inspection as required by the State of Arkansas, and are a fully licensed studio. 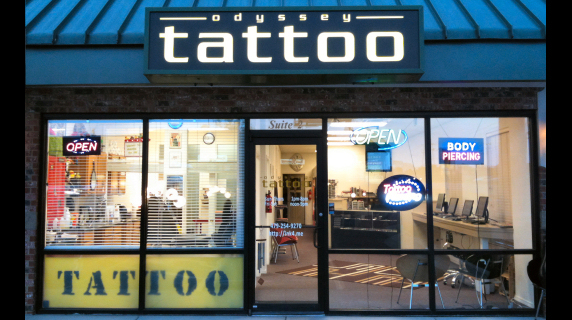 Odyssey Tattoo is inspected by the Arkansas Department of Health, and the studio license is openly displayed. All of the artists are trained to follow the required safety and sanitation procedures necessary to run a safe tattoo and body piercing studio. 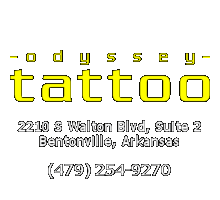 Each artist at Odyssey Tattoo is licensed through the Arkansas Department of Health, with each license on display. Come by today to meet the artists, and to look around our studio.